A rare outfit post for you today, I don't do them that often because I really can't take a good photo. This was the best of the bunch and I took about 15! I bought this dress in the sales and I was so happy to find it because it was originally about £60 in the Evans Beth Ditto range and I got it for £20 once I used a voucher I had. It's a bit dressed up for work but never mind! 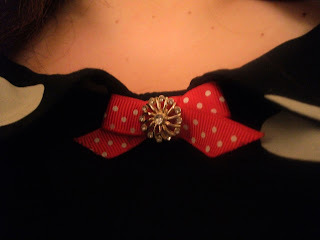 The brooch is from Accessorize and I mentioned it in my previous sales post. I'm pretty excited about the weekend. On Saturday I'm going for a meal with the girls from school to have a good catch up. I'm going to the Riverside farmers market on Sunday, then to see some new exhibitions at the National Museum and then I'm going to go to the In Aid of Vintage event in the evening to hopefully pick up some bargains and enjoy a glass of wine at the same time. Getting up to anything exciting this weekend? hehe, i can't take photos of myself for an outfitpost either!! Thanks guys. Haha I want to see the Glee tour and that will be filled with 14 yr olds. I just started a diet so I hope there isn't any free cheese tasters because I wont be able to resist! I love it, such a lovely cut! I love polka dots. I am also really looking forward to the weekend, because I am always looking forward to it!! Great dress - I'm going through a real polka dot phase at the moment, can't get enough of 'em! I love a good bargain! It's a gorgeous dress. I got a bargain dress in Evans for £10 last week! I love the Evans sales! I might see you at the In Aid Of Vintage event on Sunday, if I do I'll say hi! This dress is lovely! And your weekend plans sound great! You look gorgeous in this dress. I love it!!! Seems like a lot of people really loved this dress from Beth's collection, I do too! thats a great dress!love it! 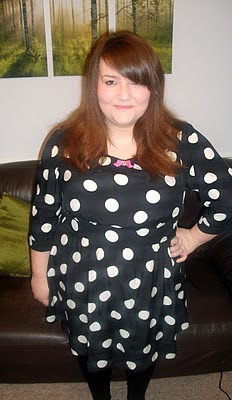 I heart this Beth Ditto dress. I haven't even worn mine yet since i have some alterations to make. Everyone I see who has it makes it look fab! Lovely dress, the bow detail is great. I normally take loads of outfit photos, there's so much dodginess on my camera! I love polka dots as well. I'm like you as well, I'll take so many pictures and only end up maybe liking one - urgh. Weekend plans, hope it doesn't snow!